Owls are distinctive birds that fascinate birders and non-birders alike, but what is so special about owls that they capture our imagination, interest and even our religions and superstitions? Learning the unique owl characteristics that make these birds stand out can help birders better understand and appreciate every owl they see. There are roughly 225 species of owls in the world, depending on how various geographic populations and subspecies are classified. These birds come in many shapes, sizes, and colors, but they are all related and belong to one of two scientific bird family classifications. The Strigidae owls are the typical owls or true owls, and this family includes the majority of owl species. They are heavily camouflaged birds and have large heads and round or oval facial disks. The Tytonidae owls, or barn owls, have more typically countershaded plumage and heart-shaped facial disks, and their body shape is a bit more tapered and slender than the true owls. Regardless of which family these birds belong to, however, they are always able to capture birders' interest. Owls are very widespread, and different owl species can be found worldwide, though none are present in Antarctica. Even in regions where multiple owls species can be found in the same types of ranges and habitats, these birds are typically solitary and uncommon. While most owl species prefer forests and woodlands, these birds can be found in a wide range of habitats, from open regions such as deserts, tundra, and grasslands to more dense marshes and bogs. Some owl species have even adapted to living in suburban and urban areas, giving birders everywhere the opportunity to go owling and add owls to their life list. Owls have many physical characteristics that make them distinct from other birds. Understanding those physical differences can help birders more easily recognize when they see an owl, and these are the first clues necessary for owl identification. Facial Disk: An owl’s face is distinctly shaped with a disk-like structure that surrounds the bill and eyes. The bird can use its facial muscles to slightly alter the shape of this disk and funnel sound more efficiently to its ears, greatly amplifying its hearing. The exact shape and color of the facial disk is a great field mark for identifying owls. Forward Eyes: Owls have forward facing eyes that give them binocular vision with improved depth perception and the ability to judge distances. Their eyes are large and are locked in the skull, which means the owl has to turn its head to move its eyes – the eyes cannot rotate independently. Owls can rotate their heads up to 270 degrees for a wide field of vision. Ear Tufts: Ear tufts are distinctive longer feathers on the side of the head that can look like ears or horns, though they are not associated with hearing in any way. Not all owls have ear tufts, but it is believed that the tufts can help with the bird’s camouflage by breaking up its outline to blend in better with its environment. The position of the tufts can also be a form of communication between owls, especially mates. Keen Hearing: While all birds have good senses, owls have especially acute hearing that can help them locate the small scuffling of prey from great distances even in poor light or complete darkness. Some owls have their ears placed asymmetrically on their heads, an arrangement that can help them triangulate prey position more quickly and accurately. Foot Structure: Many owls have feathered feet to help with insulation and to serve as minor protection from the bites or scratches of captured prey. The feathers on the feet also work similar to whiskers and help the birds detect when prey is within their grasp. Owl toes are also unique, and the outermost forward toe can rotate to face the back to hold prey more efficiently. The ways owls behave can also help set them apart. While different owls have evolved different behaviors that best suit their habitat, hunting and other needs, these types of behaviors can also be clues for birders to find, identify and appreciate owls. Activity Period: Many owls are crepuscular or nocturnal, as opposed to other raptors that are more strictly diurnal. Owls have evolved keen senses to help them hunt more efficiently in low light conditions, either at night or in twilight or dawn periods. Owls are also often active when the moon is bright. Diet: Owls are carnivorous and eat a wide variety of other animals, including rodents, insects, fish and larger mammals. Very few owls are avivorous, however, because the birds they would eat as prey are not active when owls typically hunt. Pellets: After eating, owls regurgitate pellets filled with indigestible fur, bones and other material they cannot pass through their digestive tracts. Ornithologists often dissect owl pellets to study the birds’ feeding preferences and diet composition. Flight: Owls can fly virtually silently because of a fringe on the leading edge of their primary feathers that helps muffle sound. Their wings are broad and large for their body size to help the birds stay aloft with minimal effort, which also reduces flight noises. Voice: The classic “hoot” call is not the only sound owls make. Many owls have a wide range of vocal sounds, including hisses, whistles, screeches, screams, and purrs. Owls will also use bill clacks for communication, especially when agitated. Aggression: Many owls are extremely territorial, particularly around active nests. 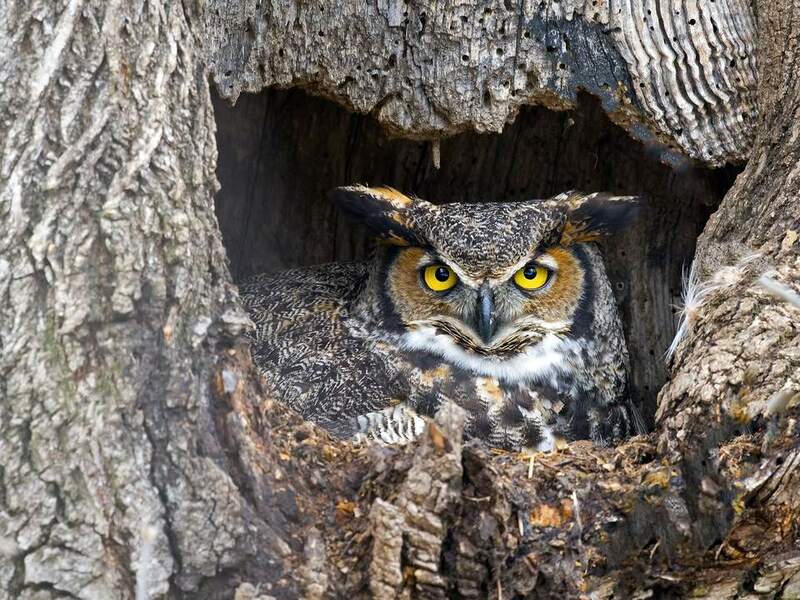 Birders should always be cautious when near an owl nest, because the parent birds may attack anything – and anyone – they might consider a threat to their owlets. Owls are unique and amazing birds with many specialized characteristics and behaviors. Birders who better understand those traits can more easily find owls, properly identify them and enjoy what makes an owl an owl.